Local Futures continues its unique and ongoing collaboration with the city government of Jeonju. On the 8th and 9th of November, 2018, we cohosted the fourth Economics of Happiness conference in a row in Jeonju City*. The conference focused on three threads: urban regeneration and the active involvement of residents; local food and Jeonju´s food plan and policy, with special focus on producers, and; local finance strategies, including a local currency pilot project. Furthermore the event served as a next step in a process of cross-pollination between the Japanese localization/economics of happiness movement and that of South Korea. This process commenced last year, when several members of the economics of happiness organizing committee in South Korea, took part in the Economics of Happiness World Forum, in Tokyo in 2017. 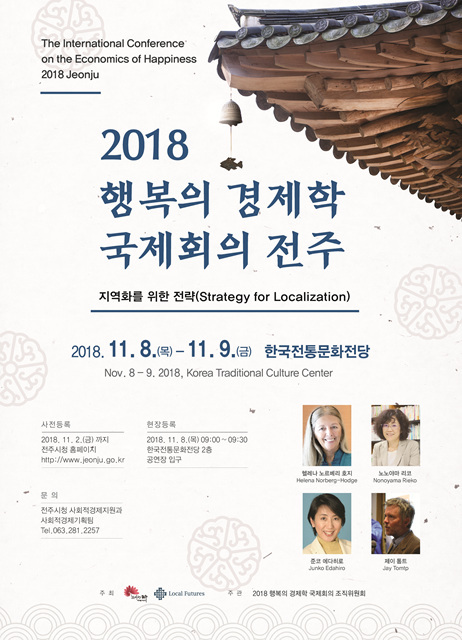 This time around, two key change-makers from the Japanese World Forum, assisted in Jeonju, to share about localization trends, strategies and initiatives in Japan. The two-day conference program included a mix of keynote speeches, panel discussions and workshops organised around the three threads of local regeneration, food and finance. Download our official event poster here: Economics of Happiness Conference Jeonju 2018.
is an environmental journalist and researcher whose publications include Beyond ‘Eco’: How to Make a Happy Future, and A way Out of the Energy Crisis. She is the founder and President of the Institute for Studies in Happiness Economy and Society, and co-founder of Japan for Sustainability. Junko plays a major role in the slow movments in Japan and works with many organisations and initiatives including Change Agent and the Candle Night campaign.